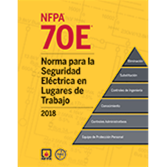 Keep the workplace safe from electrical hazards using the 2018 edition of NFPA 70E. In a fraction of a second, an electrical incident can claim lives and cause permanently disabling injuries. In fact, hundreds of deaths and thousands of burn injuries occur each year due to shock, electrocution, arc flash, and arc blast – and most could be prevented through compliance with NFPA 70E®, Standard for Electrical Safety in the Workplace®. The standard continues to evolve to address risk assessment and introduces human factors, such as human error, as part of that assessment. Annex Q, “Human Performance and Workplace Electrical Safety,” is included to provide guidance. NFAP 70E emphasizes the need to use the hierarchy of risk controls, by moving it from an informational note into the text of the standard. NFPA 70E now explicitly states that the first priority must be the elimination of the hazard.